This is of course hard evidence that the the Atlantean Bronze Age Sea culture reached deep into South America. This culture ended abruptly in 1159 BC, although low level highly secret contact did continue. The contact period ran from at least 2500 BC through 1159 BC. This is around 1300 years and may even have been much earlier. However, the contact period was underwritten by the natural currency provided by copper ingots. Plenty of shipping and plenty of small colony groups who were part of the metal working tribe. Obviously we also had a tribe of seamen as well known to history as the Phoenicians. Always good to see evidence come in. 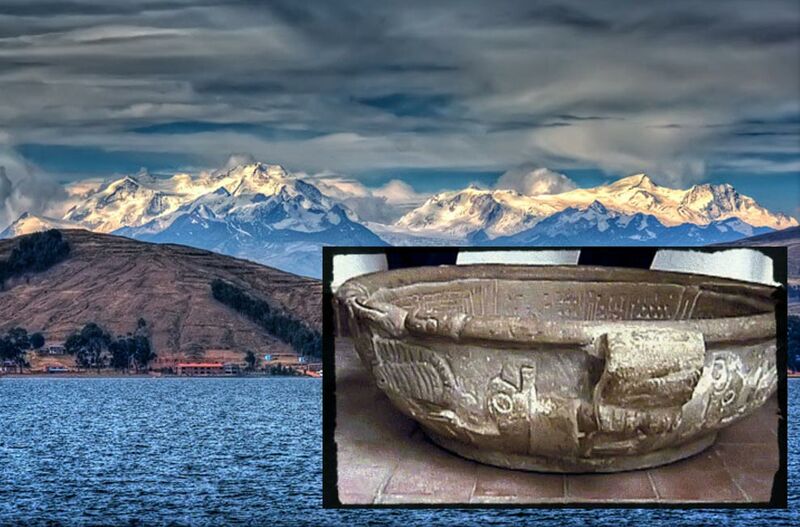 The Fuenta Magna is a large stone vessel, resembling a libation bowl, that was found in 1958 near Lake Titicaca in Bolivia. It features beautifully engraved anthropomorphic characters, zoological motifs characteristic of the local culture, and, more surprisingly, two types of scripts—a proto-Sumerian ancient alphabet and a local language of the ancient Pukara, forerunner of the Tiahuanaco civilization. Often referred to as “the Rosetta Stone of the Americas,” the stone vessel is one of the most controversial artifacts in South America as it raises questions about whether there may have been a connection between the Sumerians and the ancient inhabitants of the Andes, located thousands of miles away. The ancient relic was discovered accidentally by a farmer working on a private estate owned by the Manjon family. The owners subsequently delivered it to the city hall of La Paz in 1960 in return for land near the capital. Around the same time, Bolivian archaeologist Max Portugal Zamora learned of its existence and attempted, unsuccessfully, to decipher the unusual inscriptions, not least because he failed to recognize that the writing upon the bowl was a type of cuneiform text dating back some 5,000 years. The Fuente Magna bowl remained in storage in the Museo de los Metales Preciosos (“Museum of Precious Metals”) for approximately 40 years, until two Bolivian researchers, Argentine Bernardo Biados and archaeologist Freddy Arce, sought to investigate the origins of the mysterious relic. They were eventually put in contact with Maximiliano, a 92-year-old local who, after seeing a picture of the bowl, claimed it was once in his possession. Not realizing its significance, Maximiliano admitted that he had used the bowl to feed his pigs. Approach in the future (one) endowed with great protection the Great Nia. [The Divine One Nia(sh) to] establish purity, establish gladness, establish character. (This favorable oracle of the people to establish purity and to establish character [for all who seek it]). [Use this talisman (the Fuente bowl)] To sprout [oh] diviner the unique advice [at] the temple. The righteous shrine, anoint (this) shrine, anoint (this) shrine; The leader takes an oath [to] establish purity, a favorable oracle (and to) establish character. [Oh leader of the cult,] open up a unique light [for all], [who] wish for a noble life. This translations suggests that the Fuente Magna bowl may have been used to make libations to the Goddess Nia to request fertility. The figure on the Fuente Magna, which appears to be in a “Goddess pose,” with open arms and legs spread, is believed to support Dr Winters’ translation. However, this perspective, and indeed the initial translation work of Dr. Winters has not been without its critics. Jason Colavito, a known skeptic and “debunker,” suggests that there is only a small degree of correlation between the script on the bowl and Proto-Sumerian characters. Colavito points out that the bowl has a highly problematic provenance, and may simply be a hoax. Biados says this is incorrect, citing the overwhelming support from major portions of the academic community. It is clear that the Fuente Magna bowl remains a matter of contention between academics. It is hoped that further archaeological and linguistic research may help to unravel the story behind this mysterious artifact, as doing so may help to expand our understanding of the great civilizations of our past and their influence throughout the world. Featured image: Fuenta Magna (Courtesy of Bernardo Biados's research team) Background: Lake Titicaca in Boliva (Wikimedia Commons). The article ‘Fuente Magna, the Controversial Rosetta Stone of the Americas’ was originally published on The Epoch Times and has been republished with permission.